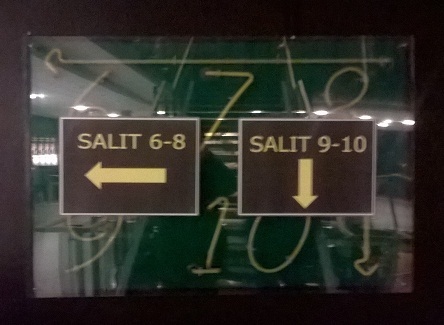 This is a navigation sign from a cinema in Helsinki. It means than rooms 6-8 are located on the left, and rooms 9-10 are downstairs. The original sign was made of fancy neon tubes. But something went wrong and simple A4 papers had to be placed on top of it.